His son is the Chazzan, but his voice he’s never heard. But he sits there enjoying every word. And he stays till the very end however long it takes. And the deaf man in the Shteeble says well done. They want to start Kol Nidre but the Chazzan’s still not there. But the deaf mans chair stands empty by the wall. Then suddenly the Chazzan, he comes rushing through the door. He’s wearing his white Chazzan’s hat he’s never worn before. He pauses for a moment at his fathers empty chair, and quietly he wipes away a tear. Then he runs up to the Beema, for there’s no time left to waste. From his Kol Nidre that Yom Kippur night. What was it he was thinking of that made him sing so well. “Well you know my dad was deaf” he said, “last night he passed away. And in a voice so beautiful he begins to sing. From his Kol Nidre that Yom Yippur night. maybe i over-analyse things, but although i enjoy this song, i always wonder why on earth the rabbi of the shul didn;t know that the deaf man had passed away? And once the chazzan had paused by his father’s empty chair and silently wiped away a tear, or even once he noticed that the deaf man, who comes to shul each shabbos, wasn’t there for kol nidre, why didn;t he realise that something must be wrong with the deaf man? and that maybe asking the chazzan why he was so late was a rather insensitive question, and he should instead have asked if everything was ok? I heard this first over 20 years ago, sung by Country Yossi who I assumed had written it. Thank you Miriam for your clarification. 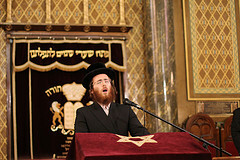 Country Yossi wrote the original parody. I don’t know who wrote this song but it is one of the most amazing and wonderful heart-felt songs that resonates with a level of my Jewish neshama that rarely awakens. I am in tears whenever I listen to it and words, although having the potential to express beautiful thoughts, fail to capture how this song makes me feel.